For people in Illawarra, South Coast and parts of Central Tablelands, Southern Tablelands and Snowy Mountains Forecast Districts. Issued at 10:17 pm Saturday, 7 July 2018. A cold airmass with very windy conditions lies over the southeast of the state. 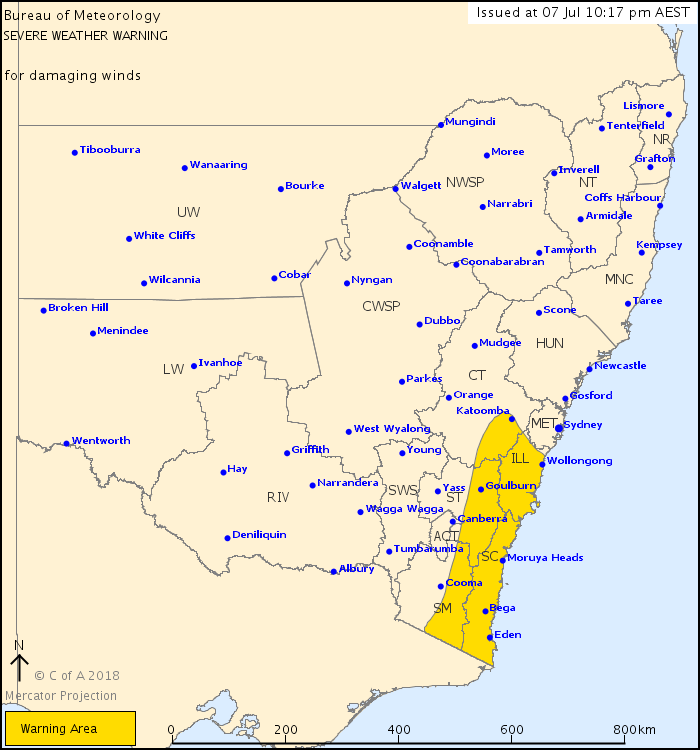 DAMAGING WINDS, averaging 60 to 70 km/h with peak gusts in excess of 90 km/h are likely for parts of the Southern Tablelands, Central Tablelands, Illawarrra, South Coast and Snowy Mountains. Winds are expected to gradually ease from late Sunday afternoon and evening. Locations which may be affected include Wollongong, Nowra, Bowral, Eden, Braidwood, Bega, Moruya Heads, Katoomba, Goulburn, Bombala, Captains Flat and Nimmitabel.